My friends call me "5". I just fired up 2014.5 and received the notice in the attached screenshot. 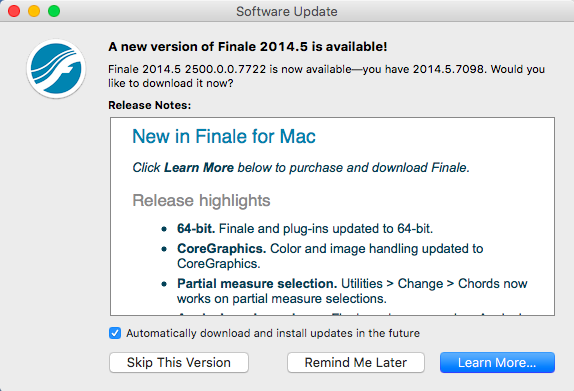 What is Finale 2014.5 2500.0.0.7722? Is this an actual release (that seems to be unavailable despite the notification) or is this simply a sales pitch for Finale v25? If so, it would be greatly appreciated if the notification was more direct and honest. I will buy Finale v25 soon. I do not need faked notices to "get my attention" in order for them to make another sale. If it IS real - where is it? There is no link and my Googling the number turns up nothing. This image has been viewed 170 time(s). Windows has a similar misleading pop-up. Strange. Okay, this is solved. I was correct. It is a lame way to get you to the Finale25 hype/purchase pages. 2014.5 2500.0.0.7722 *IS* Finale25, so far as I can ascertain. I fired up the v25 demo and checked for updates. It says the installed version is Finale 25.0.0.7722. So the use of "2014.5 2500" makes no sense. 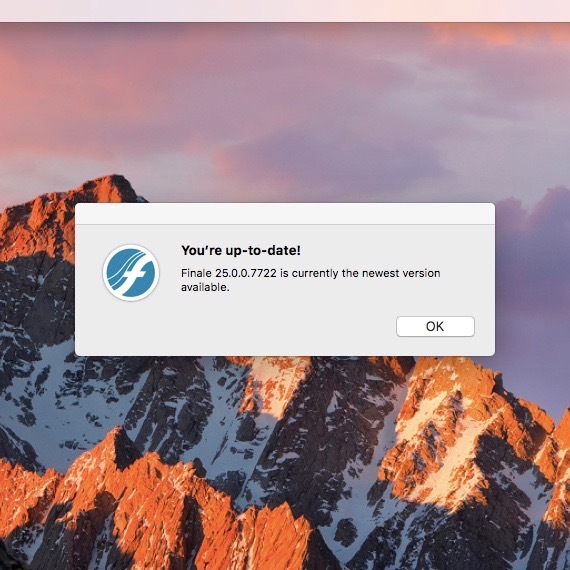 This is bogus, unless anyone can find an actual updater to the 2014.5 file. This image has been viewed 94 time(s). Reading the notes leaves no doubt. These are the features of v25. Finale 2014.5, 2014d, 2012c (main), 2011c, 2010b, 2009b, MacOsX 10.9.5, Mac Mini Intel Core i7 2,7 Ghz, 16 Go Ram, French azerty kb, Dolet 6. Full TGTools. MOTU Audio Express, 3 monitors.